On Sale Now! Save 6% on the SABRE Hardcase with Alarm Pepper Spray & Personal Alarm Combo Pack by Sabre at SMIFCU. MPN: HCPA-BKOC. Hurry! Limited time offer. Offer valid only while supplies last. The SABRE Personal Safety Kit combines two compact and easy-to-access protection options from the #1 brand trusted by police and consumers worldwide. The SABRE Personal Safety Kit combines two compact and easy-to-access protection options from the #1 brand trusted by police and consumers worldwide. The SABRE Red Personal Safety Kit, which teams the strength of SABRE Red Pepper Spray and the attention-grabbing volume of the SABRE Personal Alarm in one attractively priced package. 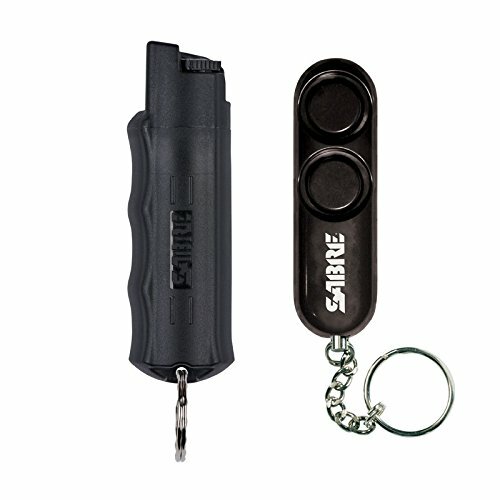 SABRE Red Pepper Spray with key ring allows for immediate access to spray while on-the-go. You benefit from protection against multiple threats with up to 25 bursts (up to 5x more than other brands) in a powerful stream delivery which reduces wind blowback. This pepper spray offers enhanced control and product retention, thanks to its durable key case with finger grip. The finger grip helps ensure you are pointing SABRE pepper spray in the right direction. Ideal for everyone from college students to busy moms, this pepper spray features a locking top safety mechanism to help prevent accidental discharge. Providing the world’s most reliable protection, our maximum strength pepper spray is backed by our exclusive in-house high performance liquid chromatography (HPLC) laboratory, which eliminates the 30% heat failure rate experienced with other brands (Source: University of Utah). This technology is the only way to ensure there are no pepper spray failures on the basis of heat inconsistency. Our HPLC technology is the industry’s #1 advantage—and it’s exclusive to SABRE. Your pepper spray will contain maximum stopping power when you need it most. The SABRE Personal Alarm provides an ear-splittingly loud noise which will help startle your attacker and turn bystanders into witnesses. This extremely loud personal alarm is 120dB and audible up to 600 feet (185 m) away. The sleek, attractive personal alarm resembles a memory stick, meaning it’s as discreet as it is loud. Offering instant access, the key ring attachment connects the personal alarm to your backpack, keys, or purse. To sound the reusable alarm, simply pull the metal chain from the device. Push the pin back in to stop the sound. The child-friendly alarm is a personal safety option for any age. Family owned and operated for more than four decades, SABRE is the #1 pepper spray brand trusted by police and consumers worldwide. ISO 9001:2008 certified, our pepper spray is proudly manufactured in the U.S.A. Protect yourself today!